Peraves CEO Roger Riedener and LA Times Susan Carpenter ready for the drive to Toyota Speedway at Irwindale in the MonoTracer. Last Thursday (October 28th, 2010) Los Angeles Times‘ vehicle expert Susan Carpenter had the privilege of experiencing the phenomenal Peraves E-Tracer and MonoTracer for her first time. 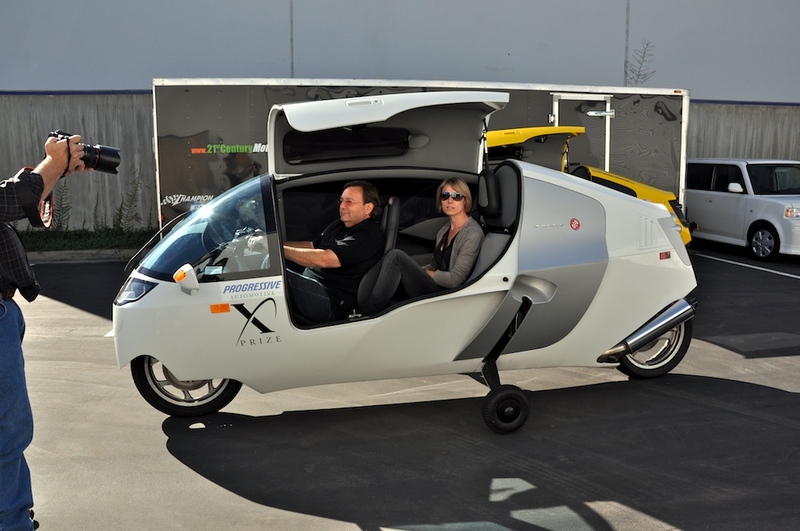 We began our morning at AC Propulsion‘s headquarters in San Dimas, CA where Susan rode in the gas powered MonoTracer with Peraves CEO Roger Riedener. 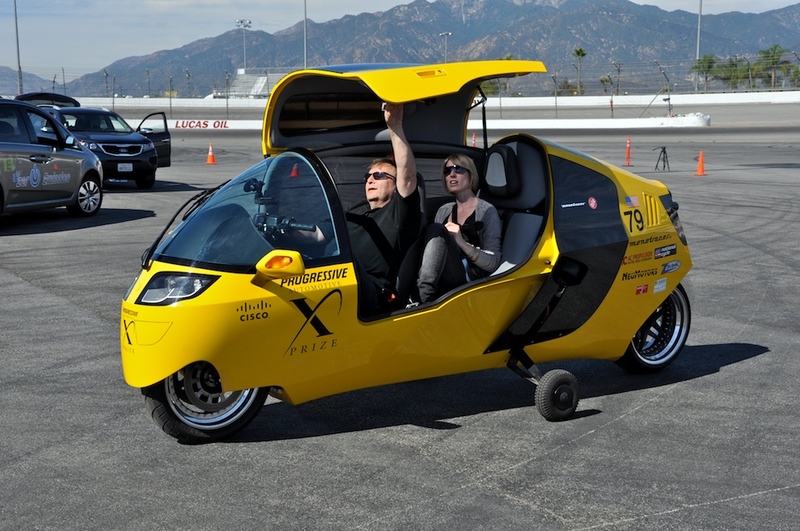 Stefano Paris was their freeway wingman piloting the all electric AC Propulsion powered X PRIZE winning E-Tracer. 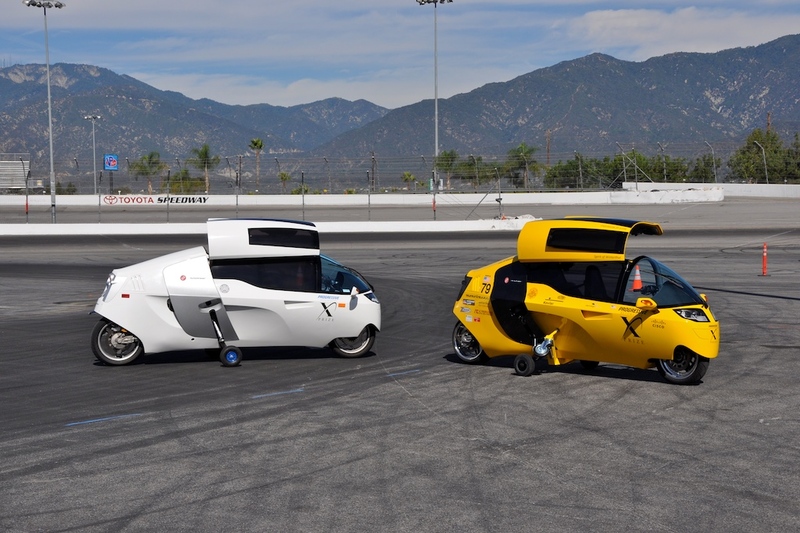 Our futuristic, efficient, and high performance caravan included AC Propulsion’s LUXGEN electric minivan as we drove over to the Toyota Speedway at Irwindale for the test drive, photo, and video shoot (Freeway photos by Tom Gage). Peraves MonoTracer and E-Tracer awaiting drives within the Toyota Speedway at Irwindale. Roger dispensing 25 years of Cabin Motorcycle experience prior to the test drives. At the Toyota Speedway we prepared the E-Tracer with an additional training wheel frame that prevents a Tracer from leaning over beyond 20 degrees. Learning to drive a MonoTracer or E-Tracer is best accomplished by starting out leaned over on a training wheel and driving forward while attempting to right oneself. It is during these first few seconds where a rookie Tracer pilot initially observes and tunes their control inputs to keep the Tracer upright. The MonoTracers are directed by counter-steering just like any 2 wheel vehicle. A new rider needs to acclimate to the counter-steering control because unlike a motorcycle, one is sitting reclined and can’t lean one’s body to “steer” the vehicle. Once a new rider masters the steering inputs required to go straight, focus is turned to insuring the stabilizer wheels are retracted and deployed smoothly and at the correct times to keep the vehicle upright at a stop. Initially it is a challenging drive but also a hugely rewarding experience. 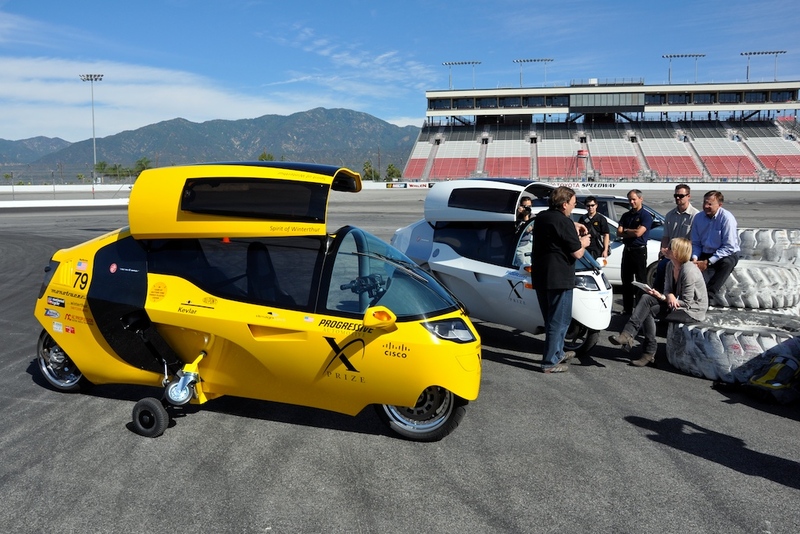 Fewer than 500 people worldwide have ever driven an EcoMobile, MonoTracer, let alone an E-Tracer. At this early date there might be more men that have flown to the moon than have driven an E-Tracer. 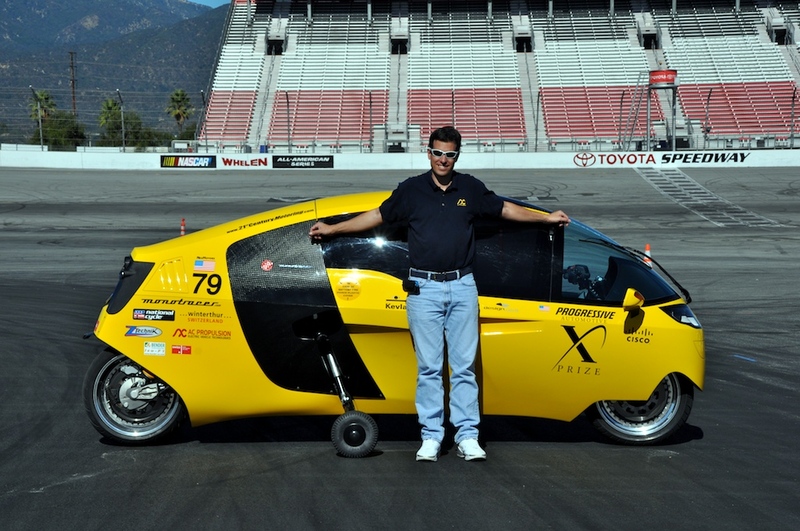 Stefano Paris and E-Tracer #7009 after piloting it to the Toyota Speedway at Irwindale, CA. Roger and Susan take the E-Tracer on a 20min run on the Toyota Speedway oval with cameras rolling. We had an exciting several hour photo and video shoot with the E-Tracer, MonoTracer, and Susan Carpenter. Susan and her Los Angeles Times camera team just completed their fantastic edit of our day at Toyota Speedway at Irwindale. View the fun below which includes an interview of Roger by Susan while circling the Toyota Speedway oval at speed in the E-Tracer. Remember, the E-Tracer #7009 has a prototype straight cut gear transmission resulting in a jet engine like whine while underway. Production Series 1 E-Tracers will have a dual helix geared transmission for a silent drive. It takes practice to master the MonoTracer. Just like in the movie ‘Back to the Future’, we hope Susan’s E-Tracer adventures will be continued… because the E-Tracer is very much like a TRON lightcycle from the future combining high performance, high efficiency, and incredible styling (with a gullwing door like the DeLorean) all in a vehicle that captures the imagination. This entry was posted in Peraves and tagged AC Propulsion, Back to the Future, DuPont Kevlar, E-Tracer, gullwing door, LUXGEN, MonoTracer, Toyota Speedway at Irwindale, X PRIZE. Bookmark the permalink.